In the Fall of 2005 I created 6 family albums for the 6 families that are the offspring of my mom and dad - Randy and Jeanine, Karla and Ed, Randy's 2 kids, and my 2 kids. 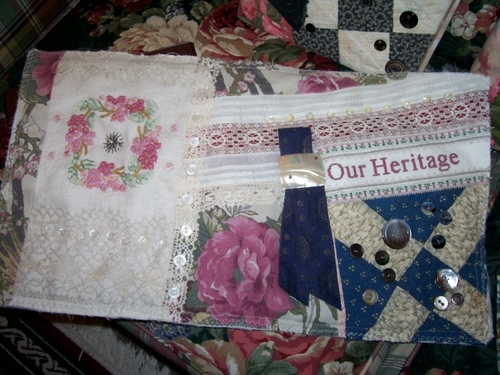 The covers were a collage of all of the odds and ends I found among my mother's and grandmothers' things after they were gone - ribbons, lace, buttons and buckles, parts of old quilts, fancy work, old petticoats, jewelry, vintage fabric scraps, etc. I felt that the album covers represented our six families - there were similarities in composition and materials, and yet each was unique, as it was composed of many different items. This represented the similarities in our family members as we are the offspring of Carl and Virginia Lofgren, yet each is unique as there are different manifestations of that genetic heritage and as the Lofgren~Dudley line has been enriched by the genetics of those who married into our families.